Aaaaaaaaand we have dunnit it again. Bet a lot of us wondered where the tour in South Africa was headed after the dismal loss in the first two test matches. And then we came back in the third test match.If a few felt - what does it matter, we already lost the series - I’d beg to differ. It matters simply because we are now here, having won the first three ODI matches, in South Africa, against South Africa. That, my dear friend, is the takeaway. We are now on top of our game. The batsmen, bowlers, and all-rounders are all chipping in equally. This team is simply amazing. If we keep at it, we do not have to try any vision 2019 that the Proteas are attempting. We have what we need to get a hold of the World Cup, don’t we? We completed a hat-trick of wins in a land whose pitches have received demerit points. Wow. Think about that. Type in controversial cricket pitch and SA will come up in the results. Moving on. Cullinan said that the second ODI has to go down as SA’s most humiliating defeat at home. I’d have to agree. And then came the defeat in the third ODI. That is just applying salt on the wound now. This was a bad defeat too. Everything from the beginning to the end. Let’s see the chronological order of the events. South Africa won the toss and elected to field. ( They hoped to restrict the men in blue to a score less than 200). After the fall of the first wicket, India was on a roll. 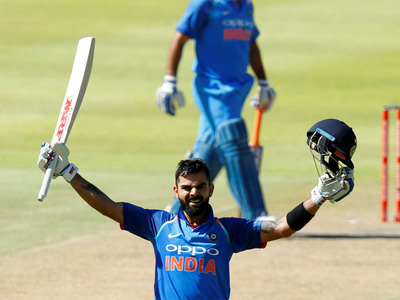 Virat Kohli’s 160 from 159 deliveries (NOT OUT) along with Shikhar Dhawan’s 76 took the team to a mammoth score of 303 from 50 overs. The bowling is not really worth talking about. It was alright. OK, I’m being nice. Then enter the South African Batsmen. Amla was out in the second delivery. He has been around long enough to have stood the pressure of the score. But he faltered and walked back. JP Duminy’s valiant attempt in keeping the South Africans on the path to the target with his 51 runs is worth mentioning. But he ran out of partners. And eventually lost his wicket (LBW). Rabada was the last man walking out. The team was all out for 179. They lost by a massive 124 runs. The Indian bowling I am going to talk about. 4 wicket hauls by Kuldeep Yadav and Y Chahal each. Bumrah took the remaining two. This was, without doubt, a commanding performance from India. Completely outplaying the home team in their own background. I know I keep repeating it but it really is worth repeating. India’s wrist spinners have taken the South Africans by surprise. We are off to Johannesburg to create history. We have never won a bilateral series in SA. I don’t think we have won three matches in a row either. So here’s to the Indian Team. Kudos. In a six ODI match series ( how did they come up with number 6? ), India has won three. Now we cannot lose the series. And we have an unassailable 3-0 lead. On our fantain fantasy app, Rebel Roy has won a whopping 1200 rupees at the Rs.500 pool. Congrats. Making Virat Kohli as the captain was his best call. Chinni won Rs.500 in the Rs.250 pool. An Akshat Patel, Rs.399. Congrats to our winners. The fourth match is on the tenth of this month. Keep your lineup ready and submit. Even if more South African players get injured, you can change the lineup and it will reflect in the pool.